Backblaze is designed unlike any other online backup software. There is no need to pick folders and files. Easy. Secure. Your computer is going to love it. Back up an unlimited amount of data. Restore by downloading anywhere or FedEx a hard drive to you. Backblaze is packed full of great features. You can back up any attached external hard drive at no extra charge. There are no limits to file size, or network speeds. Backblaze was designed to be secure, encrypted, and high performance – that's why Backblaze runs natively on your Mac or Windows computer. You can also access your backed up files on your phone with the Backblaze mobile app. It's not a question of will you lose your data—it's when. Whether it's a catastrophic event, such as an earthquake, fire, flood, or a mad panda that destroys your computer, or the more common virus, hard-drive crash, laptop left in a taxi, or coffee spill, your PC will eventually lose your photos, music, and documents. Can't I Recover Data From a Dead Hard Drive? Sometimes, but it will be very expensive. Data recovery companies will charge up to £2,000 to attempt to recover your data with no guarantee that you'll glean anything from it. For the price of one attempted £2,000 recovery, Backblaze can backup your computer for 50 years at £4/month. OK, But I Bought an External USB Hard Drive. Am I Safe? It's a good start, but as the vice president of design for Backblaze says, “better safe than sorta safe.” Do you back up your data every day? Or do you sometimes forget? Are you sure you're backing up the right files? Are your computer and USB drive stored in the same place, making both susceptible to the same risks? What if you go on a trip and leave the drive at home? You can't backup or restore files while you're gone. And if you take it with you? Then you're more likely to lose both your laptop and USB drive at the same time! So, How Am I Backed Up with Backblaze? You download a tiny application that installs in three clicks and doesn't require a credit card or any information to start using it. The application automatically finds all your photos, music, documents, and other irreplaceable data files—no matter where they are on your hard drive. 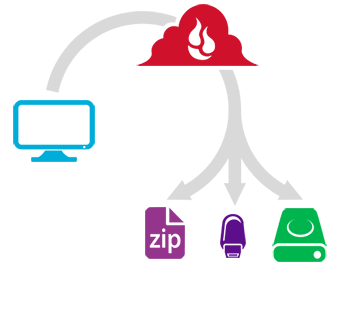 Then when you’re not using your computer, the application makes a copy of the files, compresses and securely encrypts them and sends them over the Internet to the remote Backblaze datacenters. Learn more about how they built Backblaze online backup for your Mac. Backblaze also built a great online PC backup service. How Can You Backup Everything Online For Around £4 per Month? Backblaze have developed a highly efficient cloud backup storage system that enables us to optimize how Backblaze store data. Backblaze continuously improve the efficiency of our storage system to store more data and as a consequence Backblaze has never raised our prices since starting over 7 years ago – less than £4/month for all the data on your PC or Mac.